Sundays are such a busy day at our house that I often use crock pot recipes that day. 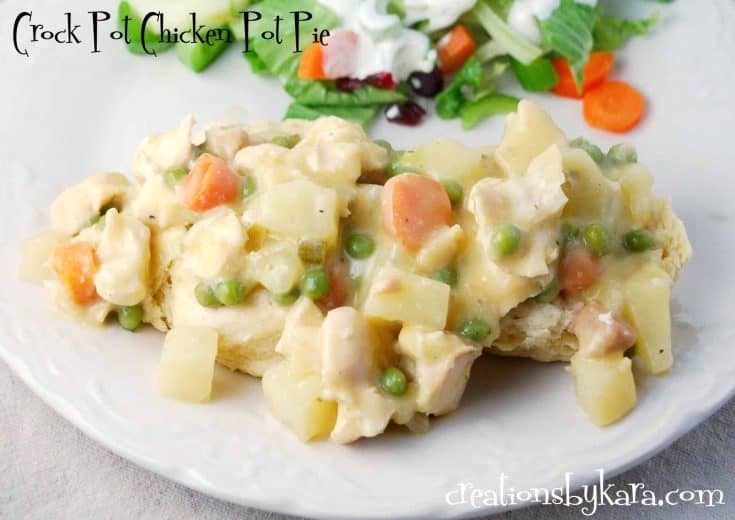 A good friend gave me this recipe for Crock Pot Chicken Pot Pie awhile back, but it has been a long time since I have made it. I forgot how easy it is (especially when you have a great hubbie or son to help you chop the veggies!) I/we put it all together before we went to church, and when we came home all I had to do was stir in the peas and bake the biscuits. Everyone in the family loves this recipe, I definitely need to make it more often. Creamy chicken pot pie filling cooked in the crock pot and served with biscuits. Place all of the veggies in a large crock pot (mine is 6 quarts). Sprinkle with salt and pepper. Place chicken on top of veggies and cover with soup. Cover and cook on low for 4-5 hours. Add frozen peas and cook 20 minutes longer or till heated through. Serve over toast, biscuits, or pie crust. Your recipies are great. But when I try to print I get all the comments of the people who have tried it. That is a waste of paper. The recipe said print friendly. Bah. 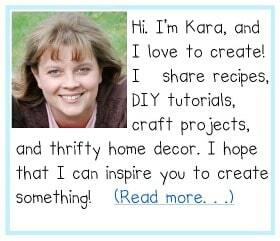 I am in the process of updating the recipes to a different format that is more print-friendly, but it will take awhile for me to get to all of them. It’s fixed and prints out fine. Looking forward to this recipe. Thanks! I tried your recipe- but the only similarity betweeen chicken pot pie and this is that it has chicken. It came out watery more like a stew..Very bland and nothing like a chicken pot pie. I will not be making this recipe again. Thanks for linking up to the CSI Project! PS We have a link party every Saturday and we would love to have you come share this! Visiting from the CSI Project. This sounds yummy. I like the idea of making pie crust shells over the bottoms of muffin tins.